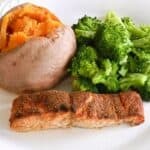 A little sweet, a little spicy makes this Spice Rubbed Salmon perfect for everyone! Mix spices together in a small bowl, set aside. Turn on oven broiler. Sprinkle spice mixture over salmon and gently rub into flesh. Place on a parchment lined baking sheet. Drizzle olive oil over the salmon. Place under broiler for 5 to 6 minutes until caramelized and golden brown. KEEP an eye on it, it will burn quickly if you are not careful! Even though I omitted the brown sugar to keep the recipe Whole 30, it is still delicious! I have not tried this recipe with honey. It may be best to brush the honey over the salmon, then sprinkle with the seasoning.